Submitted by Dan Dooré on Wednesday, January 9, 2019 - 08:42. Implementation of the game and the Adventure Game Interpreter (AGI) from Sierra https://wiki.scummvm.org/index.php/AGI on the SAM Coupé. 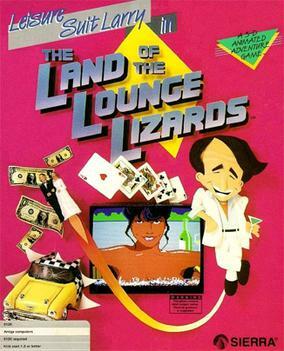 "Leisure Suit Larry in the Land of the Lounge Lizards was the first game in the Leisure Suit Larry series. The game follows a loser named Larry Laffer, who decides to visit the city of Lost Wages and find the woman of his dreams. The game features lewd scenes and sexual encounters, as Larry attempts to win the affections of many different women. This game was a graphical remake of a text adventure called Softporn Adventure, which was released by Sierra in 1981."